Before Apple bought Emagic, Waveburner was a product that could be purchased as a separate, self-contained entity. Since the acquisition, it has been bundled with Logic Pro, but often resides in the applications folder, waiting to be discovered. In SOS February 2006 (on-line at www.soundonsound.com/sos/feb06/articles/logictech.htm), we saw how Logic Pro itself can be used as a mastering tool, as it allows you access to some very powerful plug-ins. So why not use Logic? After all, you can access most of Logic's plug-ins in Waveburner. Well, to many, mastering is considered a different art, which requires an even hand across the diverse range of an album's audio material. This is often difficult to summon 'on-spec' when producing your own work from start to finish, and many find that it is good to separate the two disciplines of mixing and mastering by both a length of time and a difference of application — enter Waveburner. So what is it? It's a powerful tool that can be used to prepare your Red Book-standard CD master for duplication, and is a strong competitor to rival applications such as Roxio's Jam, which, along with Toast, is often the staple diet for the Apple-based studio user. 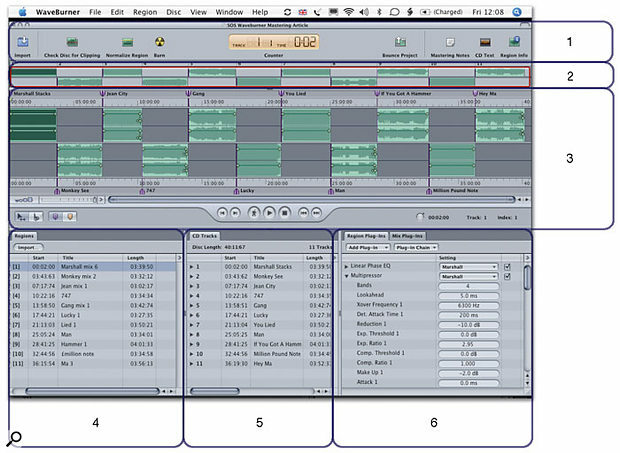 Waveburner 's features are pretty impressive, allowing entry of all manner of codes (see the 'Code Breaking' box on page 198) and track labels, plus a variety of fades and hidden tracks as required. Despite its similarities to Logic, there are some key differences in Waveburner 's appearance and operation. The first you'll notice (and the thing you'll need from the outset) is the Import icon, which is situated at the top left of the screen. Clicking on it (the default shortcut is Apple-F) causes a Logic-style file-browser to appear. From here, you can select the files you want and import them into the main window. As usual, you can select multiple files using the Shift key, and non-adjacent ones using the Apple key. At this stage, there's no need to worry about files of different sample rates and word lengths, as they can be dithered down inside Waveburner later, with your choice of algorithm. In effect, Waveburner has two stereo tracks, showing four mono files in its main waveform window. Each stereo file you load in will appear on alternate tracks, enabling you to quickly slide files about and create automatic crossfades as two tunes collide (see screen, right). Changing the order of the tracks is best done in the Regions list at the bottom left of the screen. Simply select a track and slide it up or down the list, and Waveburner will automatically order your files for you in the waveform window. When CD Players first hit the market, there were curious controls alongside the normal skip forward and back, labelled Index Forward and Index Back. These were never used a great deal, despite being in the CD specification, and subsequently seem to have been removed from the majority of CD players. However, all respectable mastering programs should be able to work with the full Red Book standard, if you need to use them. Alongside the less frequently used Index markers are plenty of codes or flags that may need to be entered. SCMS (Serial Copy Management System) allows the mastering engineer to set the options for creating digital copies from the master. This system was created to prevent consumer DAT owners from being able to make endless digital clones of an original product. In Waveburner, you have three options for SCMS: Free, Protected Original and Protected Copy. These give three levels of copy protection for the music file. Free allows multiple copies to be created from the original file. Protected Original means that a copy can be made from the CD, but a subsequent copy cannot be cloned from the first copy. Protected Copy means that no copies can be attempted from the CD you make, as the CD tells the system that it is already a copy. The SCMS system is easily overcome, so is no longer an effective prevention method, but the Red Book standard still offers it. ISRC (International Standard Recording Code) is a unique set of 12 characters embedded into the data on the CD. Each track on the album has an individual code. ISRC codes offer a way of cataloguing songs for identification purposes, and in some cases giving royalty information for radio playlists. The code begins with a two-digit country code, followed by a three-digit owner code. The next two numbers depict the year, and the final five digits are the serial number for the song. PQ is the table of information in Waveburner 's CD Tracks list. This data, which can be exported using the Export Mastering Notes feature (in the File menu), can be used to notify the pressing plant of accurate start and end times. Before exporting these, enter any additional information into the mastering notes table, where it can be amalgamated with the PQ code information. CD Text and UPC/EAN. The remainder of the important codes need to be entered in the Disc Options dialogue (under the Disc menu). There are two tabs here: one for general disc information and options, the other for CD Text information. This is good for those players that display such information, and can identify the track names, the artist, and even their website. Under the General tab, there are slots for codes including the UPC/EAN (Universal Product Code — later expanded to incorporate the European Article Numbering code). These are the bar code numbers that we see on the back of CDs themselves and they can be another way to identify the music, using the appropriate database. Other important preferences can be added here, such as default pause length and CDDA data. The application is laid out in a very coherent fashion, much like other professional mastering software equivalents. Working from the top downwards, we start with the toolbar, which offers large icons for the most commonly used features. The main tools on offer are Import (which we've already mentioned), Check Disc for Clipping, Normalise Region, Burn, Bounce Project, Mastering Notes, CD Text and Region Info. The look and feel of the toolbar can be altered using a drop-down menu that is accessed by right-clicking (or Ctrl-clicking) on the toolbar. The list allows the toolbar to be reduced to simply show an icon only, the icon and the text, or even just the text. Additionally, it is possible to change the tools available to the user by selecting the Customise Toolbar option. In fairness, there are not too many extra options outside the default set, although the addition of the level-meter icon might be useful to improve on-screen space management; alternatively, you can employ the Apple-L shortcut to display this. 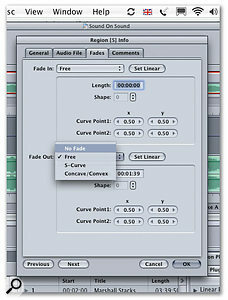 A crossfade is automatically created when two audio files collide on the timeline. Finer adjustments can be made using the diamond-shaped tags.Below the toolbar is the resizeable navigation overview, which allows you to control the region of audio you see in the waveform window. The area within the red box dictates what's displayed in the waveform window, and can be altered by clicking and dragging the mouse up and down (to zoom in and out) or left and right (to choose the desired area). 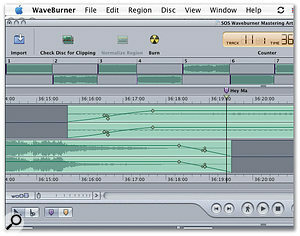 Zooming in or out can also be achieved using the scroll bar at the bottom of the waveform window, or the Logic-style zoom bars that alter the scale of both time and amplitude. As usual, there are shortcuts for this: Apple key plus cursor up and Apple key plus cursor down make zooming in and out a doddle, but they only work while the waveform window is selected. It's worth noting that the default keyboard shortcuts are listed in the PDF manual, which can be opened using the Help menu. The waveform window itself is intuitive and well laid-out, and is great at managing the layout of a project. Unlike Jam, which is a mainly text-based CD-preparation program, Waveburner allows formal pointers such as CD Track IDs and Index IDs to be seen graphically. Track pointers, or IDs, are in the form of mauve-coloured markers that sit either above or below the main wave viewer's two timelines. Beige markers indicate Index points, and additional Index ID markers can be added by clicking in the marker sections for the track concerned. Types of marker can be set in the small toolbar to the left of the transport controls, beside which are two buttons for selecting either the normal pointer or the Splice tool — depicted by a scissors icon — which can also be activated by holding down the Apple key. As in Logic, clicking anywhere on the timeline changes the play location, and double-clicking will instigate play from that point. Each waveform is accompanied by a horizontal line that we'd normally associate with track automation in Logic, but in this instance is just for editing the overall volume of each track. Additionally, at each end of the line there's a set of diamond-shaped tags that allow for the manual shaping of fade curves. As the screenshot at the top of page 196 shows, two tracks have been merged and their crossfades have been altered manually. To finely tune a fade, simply double-click the audio file in the waveform window and select the Fades tab from the Region Info dialogue box. 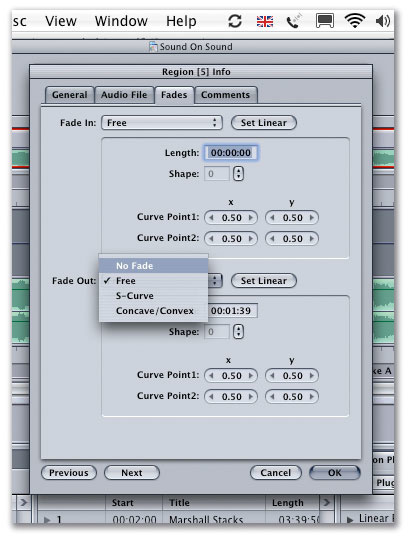 Here, you'll find choices for S-shaped, concave, convex and free fades; all of which can be auditioned by heading to Disc / Preview CD Track (Apple-K), but you must ensure that you have the start marker or the pause section selected, which are the previously mentioned mauve markers. You will notice that this feature becomes active when these markers are selected. Fades can be fine-tuned using the Region Info dialogue box. Another useful feature is Preview Disc, which can be activated by pressing Apple-D. It will play from the end of track one, for example, through to a pre-determined amount of time into track two, then to the end of track two into three, and so on, until the end of the disc. The pre-roll and post-roll times can be set in preferences under the Preview tab. To the right of the transport bar is what looks like a very small tape spool with a time display to the right of it. This display is a more detailed version of what can be seen in the counter within the toolbar and shows, by default, the elapsed time of the disc. Clicking on the spool reveals further options to choose either elapsed or remaining time of either the track or the disc. Beyond the spool and time code are the track and index IDs. The transport bar itself carries the Logic- style controls with the 'walking man' (officially called 'Catch') icon, which, when lit, forces the waveform window to follow the songs and album as it plays through. To the left of the Catch icon are the track skip controls — as you'd expect to find on standard CD player — and scrub buttons. Below the transport controls there are three lists: Regions, Tracks and Plug-ins. The Regions table lists the audio that you have physically within your Waveburner session (the files you've imported). To make life easier, you can click on an additional import button here, to add files to the session. The listed files are sorted in a compacted way, although there are small expansion triangles to the left of each one, which show more detail when clicked. Not only can you see the file information, but also the ID flag for that track. This is where any additional track IDs or index flags would also be added. All information in the table is editable, allowing for accurate positioning if you're working to a pre-determined timings sheet. The comments section permits you to jot down notes of actions or general issues about each track as you listen to it. The Tracks table, whilst looking similar to the Regions table, shows what you are committing to CD. This table is similar to information you'd find in other mastering applications, providing a host of details and choices for the track, such as SCMS, PQ and ISRC, plus a pause length and comments box. This table also has expansion triangles but the content below each track is different, showing individual events with times of pauses and track starts. The final table is perhaps the most juicy bit of mastering within Waveburner... the plug-in window! This has two tabs: one for adding processing to individual regions, and another for processing for the whole mix. Plug-ins here can be selected from a set for Waveburner which include a phase-aligned EQ, a multi-band compressor and other key mastering tools. An additional set includes the Audio Units plug-ins that come as part of Core Audio, alongside any additional plug-ins that you have installed on your system. By now, you should be getting familiar with the foundations of Waveburner. Experiment using the basics we've discussed, and join us next month for more in-depth tips and techniques.